Forum Discription: Belgium and the Netherlands. This is a very old, very basic, farmers dish from the Alsace region of France, way up in the northern cold border with Germany. Plain rustic fare that is in keeping with the people and their ways - farming, beer making, not much time for fuss and frivolity. When I first read about this wonderful, French dish, serendipity must have been knocking on my door; as circumstance had it, i not only had nearly all the ingredients for this on hand, but had also just returned home with a three-pound chuck roast and a couple of bottom round steaks and no plan on how to prepare them. not only that, the wonderful mrs. tas had intimated that she wanted some sort of beef dish for sunday dinner. the only thing missing was some appropriate beer, and a quick trip to the grocery took care of that. 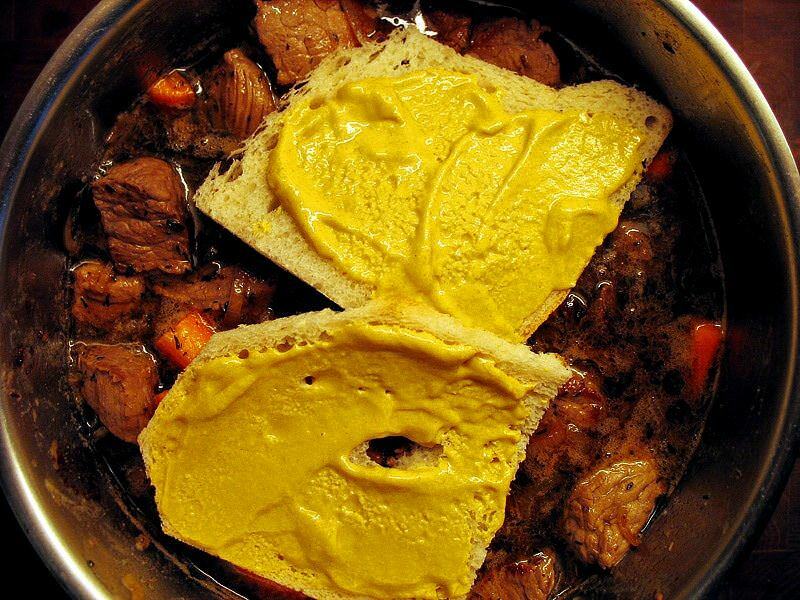 Wikipedia also noted that Carbonnade du Bœuf is a hallmark of the cuisine in the nord-pas-de-calais (artois, flanders, hainaut) and picardie regions. 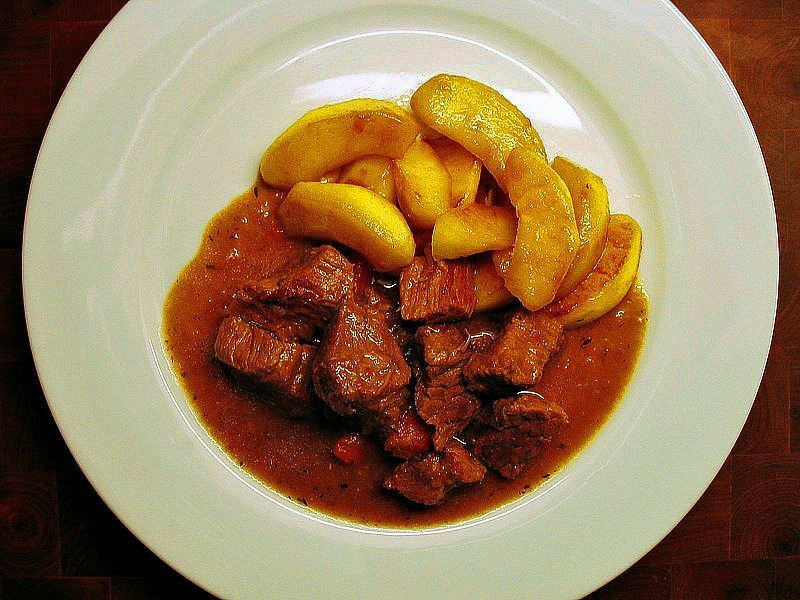 A carbonade flamande (or à la flamande), in Dutch Vlaamse Stoverij or Vlaamse stoofkarbonade, is a traditional Belgian sweet-sour beef and onion stew made with beer, and seasoned with thyme and bay. The type of beer used is important, and traditionally an Oud bruin, Brune Abbey beer or Flanders red is the beer of choice with a somewhat bitter-sour flavour. In addition to this and to enhance the sweet-sour flavour, just before serving, it has a small amount of cider or wine vinegar and either brown sugar or red currant jelly stirred in.... It is often accompanied by frites or boiled potatoes. The term carbonade may also refer to...certain beef stews cooked with red wine such as Beef bourguignon in the south of France, but is more commonly associated with the Belgian dish. Because of this extremely close relation, i decided to prepare the Belgian version; but truth be told, the method seems to be equally at home in Belgium, Holland or France - and probably parts of western Germany, as well - as it is a regional specialty of the intersection of those areas. In comparison to john's version, mine was, by necessity, going to be slightly different than his; for starters, i only had red wine vinegar, so i used that. also, not having a cast iron dutch oven at the time, i planned on making this in an earthenware crock. i would use the the crock for the oven only, and do the browning/deglazing in my trusty copper-bottomed stainless steel pan. 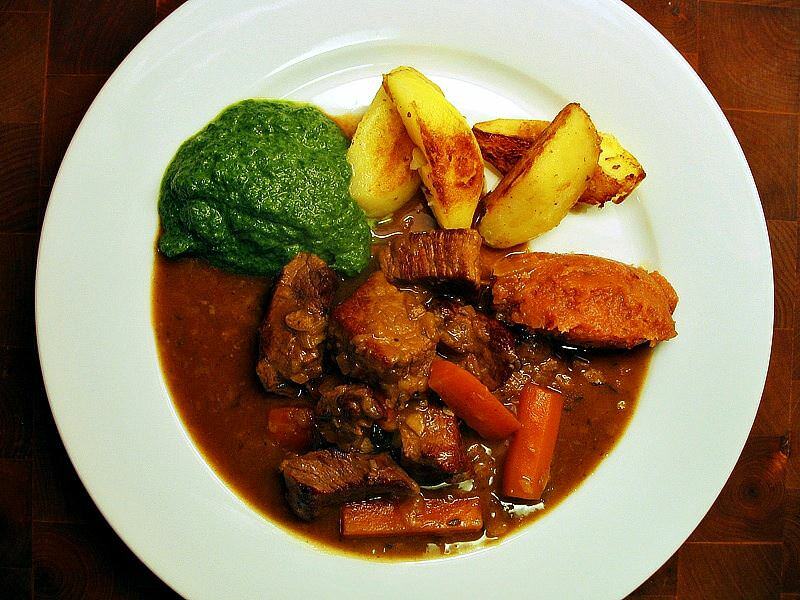 finally, whereas he used Guinness, i used a Belgian-style beer called Blue Moon, a nice choice that incorporates orange peel and coriander to great effect and, while it is probably not completely authentic for this dish, as it is too light, it worked very well. For the sake of convenience, here is a shopping list and summary for this outstanding, rustic, peasant dish! Pre-heat oven to 325 degrees. Slice onions thickly (perhaps 1/2 inch) into disks. 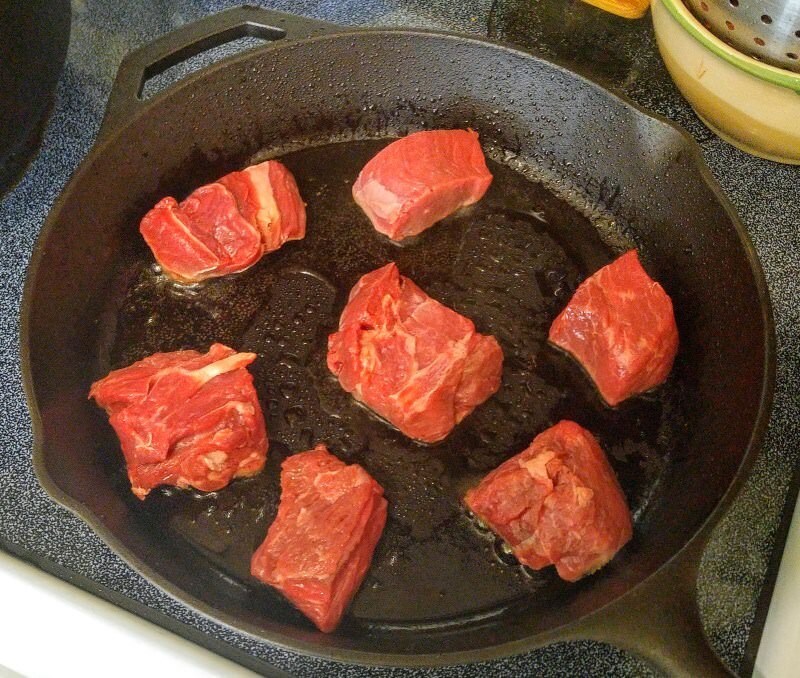 Trim of most of the fat from beef and cut into approximately 3-inch by 2-inch chunks and put them into a bowl. give them a modest shake of salt and freshly-ground black pepper, stirring to coat. Measure out flour into a bowl or cup. Pour 2/3 cup of wine vinegar into a bowl or cup and de-cap beer bottles. Crush and peel garlic cloves and put them into a bowl with the thyme, bay leaves, bullion cubes, salt and pepper. Heat 3 to 4 tablespoons butter and/or olive oil in a wide skillet or sauté pan to high, but back off a bit of it starts to burn. Alternately, this recipe can be made entirely within a cast-iron Dutch oven. Toss onions into pan and sprinkle a bit of salt on them to help release moisture. Sauté until well-browned and caramelized on both sides; if the disks come apart into rings, don't worry, but try to keep them whole. Remove from heat and place half of the onions in the bottom of an earthenware crock, reserving the remainder. If using Dutch oven, simply put the onions in another container and set aside for now. Add a bit more butter and/or olive oil to the pan. When hot, add meat (in batches) and sear on all sides, it will take some time to cook the moisture down; stick with it! Just when you are about to give up, the real majority of the moisture will get cooked out and the meat will get well-browned on all sides and the liquid will reduce into a wonderful, flavourful, thick hot mess - you will also start to get browned bits in the bottom of the pan. Place meat on top of the bottom layer of onions and sprinkle the flour over the meat. If using Dutch oven, put meat in a bowl and set aside for now. De-glaze the pan or Dutch oven with the balsamic or wine vinegar, stirring well to lift all the brown bits from the pan. When the vinegar has reduced down to a thick, caramelized liquid, drizzle it over the beef in the crock. If using Dutch oven, remove from heat, place half the onions on the bottom and stir them around to mix with the deglazed liquid, then place meat on top of the onions. Sprinkle the flour over all, along with the garlic, thyme, bay leaves, bullion cubes, salt and pepper. Spread remaining onions on top and pour in the two bottles of beer. Cover crock or Dutch oven, making sure that some steam will be allowed to escape, and place in oven at 325 degrees for half an hour, then reduce heat to 300 degrees for two-and-a-half hours. Remove from the oven and remove the cover. Sauce should thicken while standing. If necessary, heat uncovered until it thickens to desired consistency. Carbonade Flamande should be dark, thick and rich, like a stew or gravy. Serve with potatoes cooked your favorite way, rice, noodles or dumplings, along with your favorite vegetable, as well as a good beer - Belgian, if possible. 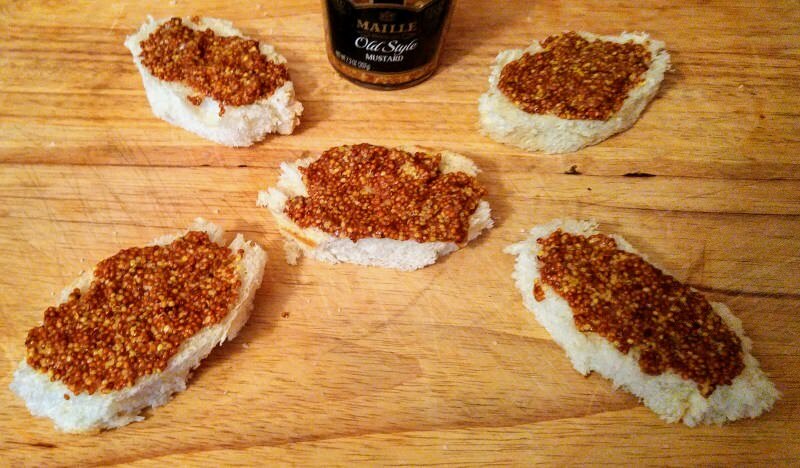 Don’t forget to have some sliced, crusty warm bread for sopping up the sauce! Here's how it went down the first time I made it. I wish to stress that my techniques and execution were not perfect by any means, but the Carbonnade was still - in spite of my inexperience - very good. Since then, I've picked up a few concepts and have refined some of the techniques - and I've also taken some much better pictures. If this recipe interests you, please read on for some excellent discussion, lessons learned and great photos! For the most part, i followed john's procedure very closely so that i would have a "base line" for future experimentation. Later, I picked up a few concepts along the way that seem - to me - to be an improvement. Note that this is so simple and yet so little is needed; it is hard to explain how much bang for your buck you get with this dish. it is a perfect example of peasant food in that it takes such simplicty and turns it into such wholesome, rib-sticking goodness that you can wrap yourself in. The beef used was about three-and-a-half pounds of chuck roast in combination with about a pound-and-a-half of bottom round steak. This is a huge amount, but there were over half a dozen of us to feed that day, and we wanted leftovers. To begin, I trimmed the meat to remove most of the fat, but did leave a little on. the beef was then cut into chunks around three inches-by-two inchs, give or take. Note: See below for notes on how this could have been done better. Note - these next photos aren't the best; scroll farther down this topic for some better ones! I then sealed the crock tightly with foil (see below for thoughts on this action) and set it in the middle of the oven. I got a late start to making this, so I had to deviate from the original cooking times and temperatures a bit, but i see nowhere that it adversely affected the final product. By now, there were so many good smells going on that it was hard to take them all in. it was 6:15 pm and we were looking at a long, slow braising ahead of us before we could eat. the oven was preheated to 325, and i made the decision to braise the beef at this temperature for two hours. i was concerned that any higher temperatures might result in tough meat, and i was afraid i may have traded time for quality, but as it turned out, my fears were unfounded. Two hours later, the beef was done. i removed the crock from the oven and set it on the stove top on a burner that was just barely on "warm" and covered it with a towel to keep warm. i then threw the temperature of the oven up to 450 for about a half hour in order to finish the OMG potatoes that were going to be sitting next to this stew. after maybe 20 minutes, i carefully lifted the foil off and saw that there was still a lot of liquid in the crock, but that was no big deal - it smelled so good, and just needed a little thickening. i left it uncovered, bubbling nicely, in order to thicken up a little. Reception of this simple-yet-exquisite peasant dish was very good all-around and ranged from "wonderful!" to "perfect!" speaking for myself, i just flat-out LOVE it when a person can take such simple, easy and basically CHEAP stuff and turn out a work of art. this was absolutely one of the best meals I had emjoyed in quite a while - probably since the http://foodsoftheworld.activeboards.net/poulet-aux-quarante-gousses-dail_topic13.html - Poulet aux Quarante Gousses d'Ail that I made for the first time during the previous autumn. The family loved it. 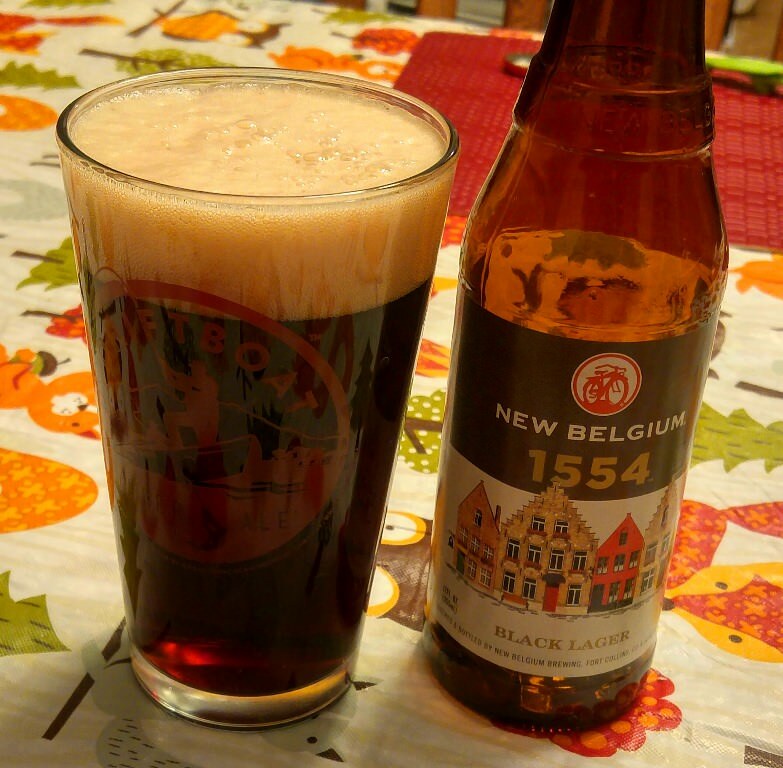 when i described what i was fixing for supper, my dad had given me a hard time for using "fancy" beer (wasting it, in his mind), but he had to admit the results were outstanding. in his opinion, it was a little heavy on the garlic (i really like garlic), but the only real complaint that i heard that evening was that there wasn't enough for a 3rd helping! for my part, i thought that the garlic was just right in it. The potatoes and vegetables made the perfect side dishes and the cottage cheese/chive bread was perfect for sopping up the rich, thick gravy. the chuck was fork-tender - fell apart with just a little pressure on the chunks - even the few chunks of bottom round steaks that i added were very, very tender. not quite as much as the chuck, but still able to cut with a fork. the slight tartness of the red wine vinegar worked perfectly with the onion, thyme, garlic and beef flavors. the Blue Moon beer had some orange peel and coriander as part of the profile and even though i couldn't specifically pick those flavors out, i knew they were in there and i think they blended with the other flavors perfectly. this was a home run out of the park. I only had 3 onions - a fourth would have been perfect and even a fifth wouldn't have been excessive. caution to anyone who makes this dish: it seemed like forever to get the initial moisture out of there, but it was worth it when it finally boiled off and the serious browning began, the incredible beefy good news was all there. stick with it and you will be rewarded! (Ditto the note immediately above). I will improve on these issues next time - and there WILL be a next time! the house still smelled like carbonnade this morning - loved it. rich and savory. I know that this post is a bit jumbled, but that's how it went down! Even with the things that didn't seem to go right, it turned out just about perfect. I very strongly recommend this dish for anyone who wants a wonderful hot meal on a winter's evening. Holy moly and the rest! What a fantastic, delicious, historical read, Ron....I loved it! Superb research and maps to go along with such a fantastic account of a lovely dish. I'm so glad you made it- you certainly understand all my gushing about the smell and flavor and tenderness for simple ingredients that we already had in the house....that is the best way to cook. This certainly was a bullseye for you and your family. Having tasted Blue Moon beer, I can imagine the underlying notes in the gravy...it does have a unique taste that definitely is more in line with the Belgian version of the carbonnade than the Alsatian one. You know, there is an international wine and beer chain here that has beers from everywhere... I just might splurge the next time I make this and buy a quart of Belgian or bitter beer. I know they have them and they come in quarts...some with a cork and foil like wine. Some come in crockery bottles, big beautiful things well worth keeping afterwards. Like you, we're definitely going to add more onions next time! from a friend in france who saw our posts! Originally, beef was cooked this way with red wine in regions like Burgundy, it became carbonnade flamande when cooked with beer that was and still is more common in Northern France and Flanders as well as in Alsace where beer and white wine are more common than red wine. You guys make my mouth water, quite a while I did not cook that. i can't stress enough how easy and good this dish was, and how relatively inexpensive it is for the amount of food we got. this literally fed six people twice over for probably less than 20 dollars, but it tasted like something a person would pay a lot of money for at a restaurant. absolutely a make-again meal here! i think a specialty belgian beer would definitely be fun to do this with and would provide just a little extra touch of atmosphere if someone is looking for an old-world experience! Doggone it Ron. As if I didn't have enough sites to keep track of now you've got to go and start another one. This is the third time you've got me hooked on a site. A 3 pound, very lean, sirloin tip roast cubed to about 2" x 2". Two softball sized Vidalia Onions sliced in pie shapes top to bottom so I had petals instead of rings. The rest was the spices you detailed in your list above. hey, mike! thanks for joining and glad that you gave this a try! looks like it was a smashing success with your adjustments and it was a hit with mrs. RD. excellent! keep looking around here, you're going to find all kinds of good stuff! Life's hard, it's even harder when your stupid. after http://foodsoftheworld.activeboards.net/forum_posts.asp?TID=274&title=carbonade-flamande - my first attempt with belgian carbonade flamande , i was suitably impressed and couldn't wait to try it again. that opportunity came on the day of my #2 son's graduation this last weekend. we had planned to do barbecue, but due to the forcasted weather this came off the table. i went over a few options for dinner with him and he chose this dish. interestingly, this time around i had a new http://foodsoftheworld.activeboards.net/forum_posts.asp?TID=557&title=dutch-ovens - cast-iron dutch oven with which to try the carbonade. i had never used one before, but i am a true believer after this dish! the DO has the 3 legs on the bottom, so i wasn't really able to use it for browning the onions and meat. what i did do was pre-heat it in the oven and then reduced the pan drippings in it after deglazing and scraping them off the pan i used. from there, i prepared the dish in the DO and slipped it into the oven. one thing i learned from my alst attempt at this was to sear/brown the meat as long as possible so that all the moisture is brought out and reduced down. this helps the meat soak up the beer and other braising liquids and maximise tenderness and flavour. i also tried to cut the onions thicker this time around so that they stayed in discs, but alas, i didn't quite cut them thick enough and once again they came apart. no big deal - the end result was outstanding! and here's a shot when the carbonade was finished. please note that due to camera settings, it appears lighter than it was - maybe the flash or something was a little too close. enjoy the pix, but in reality, it tastes even better - give it a try sometime using the recipe and method above! a) rather than red wine vineager, we decided to try some white balsamic vinegar that john had sent. this really catapulted the dish into another ballpark and was in my opinion, an act that brought us a bit closer to the true original carbonade experience, since the large majority of wines produced in this region are white wines. b) where the recipe calls for a couple of bullion cubes, we elected to use a pint of home-made antelope stock; results were quite wonderful! the beer we used for this carbonade was http://foodsoftheworld.activeboards.net/forum_posts.asp?TID=836&title=new-belgium-1554-my-new-favourite" rel="nofollow - new belgium 1554 , and i must say that it was an outstanding, rich choice for this deep, full-bodied meal and that game that it was made with! for all of you who haven't yet tried carbonade flamande, my only question is, what are you waiting for? Ron, I'm SOOO going to have to try this, with venison. I've liked this dish ever since I first tried it and have made it several times this past year. It NEVER gets old! 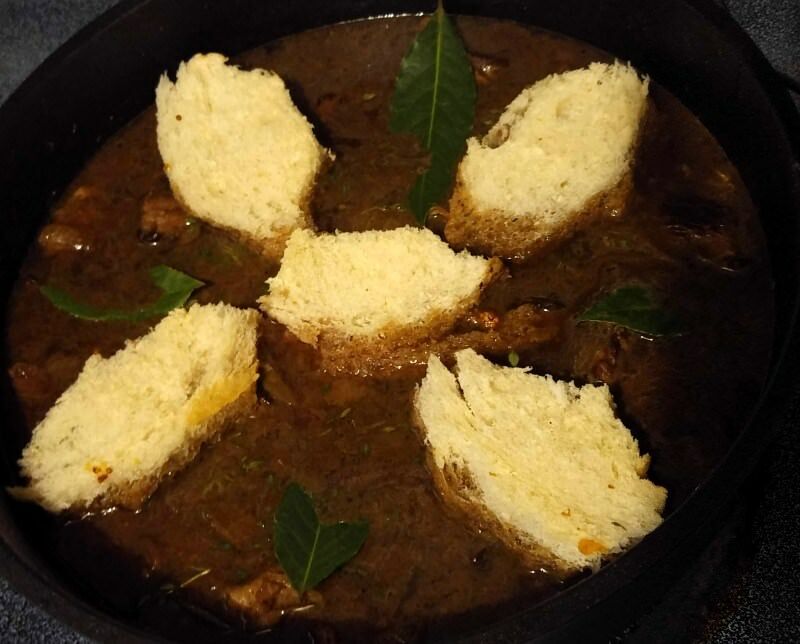 Not long ago, we acquired a new "kid" (a friend of one of my sons) who will be staying with us for a few months, and I decided to share this excellent peasant stew with him. The ingredients and procedures for preparing this dish are outlined very well in the links above, so you can check those out if you want, and i will cut to the chase here. This is a dark, Belgian-style beer that is based on a very old recipe and is - in my opinion - among the best choices for this beautiful dish, if you are going to use an American beer. When I put everything tgether, I omitted the thyme, since the brautiful Mrs. Tas has expressed her dislike of that herb; other than that, things were pretty much right along with the ingredients and preparation as noted above. Right before it went into the oven, however, I realized I had put the flour on top of the top layer of onions, rather than on the layer of beef. If you haven't already tried this, I sincerely hope you do so soon ~ it's so easy and so good - and to be frank, it's so cheap, that there's no reason not to! This looks wonderful, I'm definitely going to give this one a try! Thanks for posting, Ron! As you know from my Facebook post, I tried this recipe recently with some moose that was given to me. Of course I used Moose Drool beer too! This recipe is absolutely FABULOUS! I snapped a crummy photo with a cell phone, please don't hold it against me, LOL. looks great, debbie! wish i would have been there to give it a try! You are correct that the "beefy goodness ... left in the pan" is the foundation of your sauce in a recipe like this (or in other braises, stews, and things like chili made properly with cubes of meat instead of with ground beef.) In fact, that "goodness" is called the fond in French technique. But in your example, you are really trying to brown far too much meat at once to fully develop the fond, and thus your dish won't have the full depth of flavor that it could. Instead of trying to brown all the meat at once, as in your photo above, you should instead divide it up into 3 or four batches. Then you can leave sufficient space between the pieces in each batch as you brown it off so that it will actually brown well and develop at deep fond instead of spending most of its cooking time actually steaming. Also, to fully develop the browning and fond, move the meat around as little as possible -- just turn it onto another side when one side is fully browned, don't keep stirring it around. If you thought it was good before, you'll find it to be even better with a little technique and a little more time. Many thanks for your excellent advice on the fond; it hasn't occurred to me in all the times I've made this, but, it makes perfect sense to divide the beef into smaller batches in order to keep the moisture at a manageable level that will let the meat sear rather than be saturated with liquid. It also makes sense to keep it in motion as little as possible. Great tips - thank you! Feel free to make yourself at home here and jump in on any existing topic, or start one of your own. We've got a pretty decent crew here, and by the looks of it, we may have just gained another great member. If you have any questions or issues, let us know. Stew beef is on sale this week, so I might take a stab at this....it'll either be this or my Guinness stew. the beer was a little heavy....hoppy.....a little too something for my tastes as far as drinking,and to my tastes, wasn't quite suited for this dish. if anyone likes that style of beer and has access to it, it's worth a try. if anyone wants to try it but doesn't have access, let me know and i will see what i can do. preparation went off without a hitch - maybe a little too much onion, but no worries there. i tried to use some methods that daikon has suggested for maximizing the impact of individual components. it looked absolutely wonderful coming out of the oven, and smelled as good as it looked. served it over home-made mashed potatoes with only a little butter, salt pepper and a shake or two of parmesan/romano/asiago ~ the potatoes were very good ~ too many times we choose instant potatoes for convenience, but the truth is that it takes no time to mash some! results were mostly good, but something was a little off; at first i thought it was the carrots, but finally decided it was probably the beer, whic, as i say above, was pretty assertive. in reading the description of that beer, i saw it was quite a bit of an overdrive where hops are concerned - that might be it....also, the meat was just a little soft, but this is to be expected with venison, especially when the cuts i used were from the loin and hindquarter. aside from those two minor issues, the technique itself was once again validated ~ everything else came out neary flawlessly, and in spite of the beer, it was some very good stuff ~ no leftovers! i would definitely say that anyone who likes beer of this type, would probably really like this rendition - the lack of enthusiasm for this was my own personal preference only. great looking stuff - if you find a favourite beer to use, stick with it as your "go-to" beer for carbonade, but at the same time, don't be afraid to experiment and possibly find a new favourite. so far, i've listed my best results for beers in other parts of this thread, but if i come across any others, i will be sure to note them here. Ron, you will never hear me complain about the authenticity of dishes like this. There are as many versions of this dish as there are cooks. Of course, there are a few things that will always make it a little more original. In this case only two elements are absolutely required; dark beer, preferably not too sweet and (Dijon-style) mustard. Many other elements can be used, but they are optional; dark brown sugar, (veal) stock, a tangy cherry beer, apple-and-pear thick syrup, carrot, a sliver of good, dark chocolate,... etc. Concerning the meat; always use the tougher (and thus cheaper) cuts. Here is a nice dark beer and a little dark brown sugar. One big misunderstanding is that you need to make carbonades as dark as possible. I'll opt for as tasty as possible and a nice healthy color. Darker color comes mainly from browning the meat when searing it and just a little from browning the onions. The whole process is mainly as Ron already mentioned. I always use a frying pan AND a large cooking (stew) pot (sometimes cast-iron). 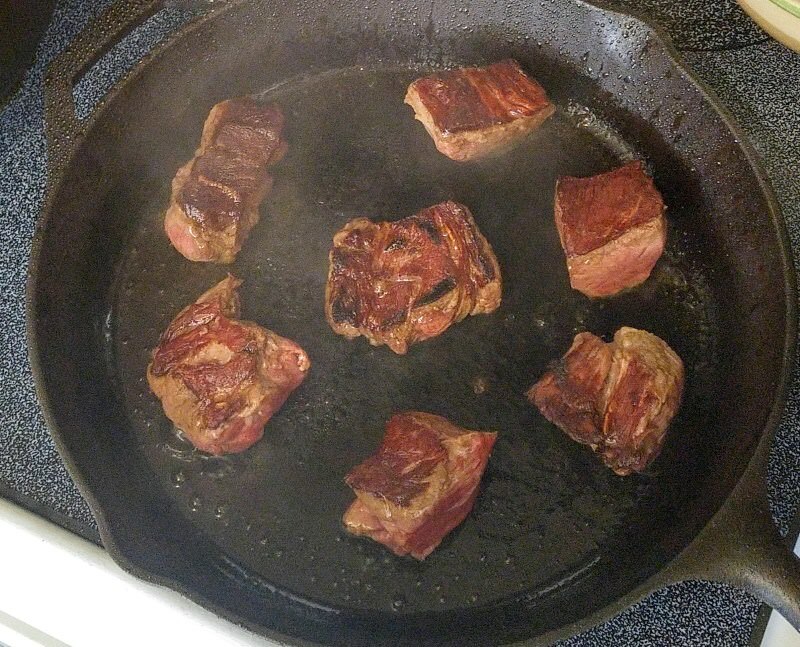 Sear the chunks of meat on high fire in a frying pan. I use sunflower oil. Be sure not to covercrowd the pan. Halffull is much better, if you don't you will be boiling the meat in their own juices instead of searing it. You need to take your time for this; put the chunks in one by one and don't move them around all the time, don't shake the pan either, just leave them. Sear all sides nicely. Transfer to the cooking pot, on top of the onions, some S&P!. Sear the next batch of meatchunks until all meat is done. You may have to add some oil to the frying pan. Don't worry how brown the bottom of the pan now looks. Do not remove it!!! Sprinkle a tablespoon of plain flour over the meat which is now on top of the onions in the cooking pot. Put the fire a little higher, stir and let the flour cook just a little. It looks messy, but hey. Back to the frying pan; put it back on the fire and pour a bottle of dark brown beer in it. Scrape the "suc" or "fond" from the bottom using a wooden spatula. Pour over the meat in the cooking pot. Fill the bottle with water and add to the pot. The meat should be only just covered with liquid. Many times a dark veal stock is added too in pro-kitchens. I like to add just one coarsely cut carrot, no more. A good sprig of thyme is a must IMO! One or two bay leaves, a tbsp of dark brown sugar, now cut the crust from one or two slices of bread and put a generous layer of mustard on. Unlike in the picture, put them on top the mustard facing downward. The mustard gives the sour component. You can add a few drops of vinegar at the end of the cooking time to correct the acidity. Mustard is a must! Dijon-style. We have a few artisanal mustardmakers in my country, I prefer those, they are basically Dijon style. If all goes well, 90 minutes later the meat should be done. Tasting is a must, if the meat isn't not soft enough, give it another 30 minutes. S&P!!! Here's a recent version served with panfried boiled potatoes, homemade spinach and a quenelle of quince at the right side. Many thanks to you for offering your thoughts on this, Chris - carbonade flamande has become one of my top 5 favourite dishes to make and enjoy! Based on the comments and suggestions here from you and Daikon, I was able to give some improvements a try ~ My youngest son was sick yesterday, which necessitated my staying home from work in order to care for him and take him to the doctor. Because of the business of the day, I had planned on simply getting some frozen pizzas for the family for supper; however, I discovered that in our local, small-town grocery they are extremely expensive. As I walked past the meat case, I saw a very beautiful 4-pound rump roast at a really nice price - about half of what all the pizzas were; in fact, the price was so good that I was also able to afford the beer for carbonade, which was the only other ingredient that I didn't already have at home. Normally, I use chuck roast for this dish, and it works very well; however the rump roast, in my opinion, is equally suited for carbonade, with decent marbeling and really good braising properties to bring out its wonderful flavour - in my opinion, it is nearly as good with rump roast as it is with chuck roast. We’ve shaken up traditional tastes by brewing a spiced Belgian-style wheat ale with real orange, lemon and lime peels, and then added a little coriander spice to the mix. This uniquely-crafted and award-winning ale is unfiltered to create a brew that is naturally cloudy with a light golden color and a smooth, refreshing finish. Probably not the most traditional selection out there to use, but it was one I hadn't tried, so I figured why not? Normally, I'll use http://www.newbelgium.com/beer/1554 - 1554 from New Belgium , a very good choice which is based on an historic Belgian recipe, or http://www.harvestmoonbrew.com/index.php?p=beltian-white - an excellent choice from a local brewery in Belt, Montana called Beltian White ; either of these has worked very, very well for carbonade, and are easily my two top choices. The former is darker, deeper and probably more "original," but the latter is very nice as well - in my opinion, they are equally good, in different ways. After trying the carbonade with this Shock Top, I'd have to say that it is also a "dang good" choice. I tried to incorporate some of the suggestions in the preceding posts, such as Daikon's advice to sear the meat in batches. This worked very well, giving a nice, beautiful sear to the meat using my http://www.walmart.com/ip/Tramontina-6.5-Quart-Cast-Iron-Dutch-Oven/11989387 - Tramontina , even on a medium temperature setting; however, I do have one question: I noticed when i seared the beef, then set it aside to do the next batch, that the seared meat "bled" out a lot of "juice," filling the bowl that was holding the seared beef. Is this normal and nothing to be concerned with, or should I be searing more moisture out of the meat (which will of course turn into fond in the pan and be returned during the braising process)? Should I toss the juice back into the pan to reduce into fond, or simply add it back to the dish when I return the beef to the pot? I was also able, for the first time, to try two of Chris's suggestions above: the dijon-slathered bread slices - using whole wheat bread - and adding a bit of dark chocolate to the dish. Both additions were very good, contributing very positive depth and flavour to the finished carbonade. The dijon mustard brought the dish into really nice balance with the salt, the sweetness from the onions and the acidity from the white balsamic, and worked very well with the full-on beef flavour. The dark chocolate brought a richness to the foundation of the dish and, I think, contributed to the texture or "mouth-feel" of the carbonade. In both cases, if I wouldn't have been the one adding them, I wouldn't have known what they were, but I could sure tell the difference as compared to previous attempts. These were outstanding suggestions that really improved an already-delicious meal, and I heartily thank Chris for both of them. As noted above, this carbonade turned out very, very well. The braised beef and the carmelised onions gave the dish a rich, dark colour, and the long, slow cooking in the enameled cast-iron Dutch oven reduced the beer and juices down to a really nice, thick stew, which we served over rice. In addition to the impressions I already mentioned, the beef was very tender with delicious, hearty beefy flavour, with bright, spicy highlights from the beer, which worked very well for this. The entire family enjoyed it, and it was easily one of the best carbonades I've ever made....and light-years better than frozen pizza! I tried to incorporate some of the suggestions in the preceding posts, such as Daikon's advice to sear the meat in batches. This worked very well, giving a nice, beautiful sear to the meat using my http://www.walmart.com/ip/Tramontina-6.5-Quart-Cast-Iron-Dutch-Oven/11989387" rel="nofollow - Tramontina , even on a medium temperature setting; however, I do have one question: I noticed when i seared the beef, then set it aside to do the next batch, that the seared meat "bled" out a lot of "juice," filling the bowl that was holding the seared beef. Is this normal and nothing to be concerned with, or should I be searing more moisture out of the meat (which will of course turn into fond in the pan and be returned during the braising process)? Should I toss the juice back into the pan to reduce into fond, or simply add it back to the dish when I return the beef to the pot? Normal. Sometimes you'll get more juice from resting meat, sometimes less. Just add it back to the braising liquid when you return the meat, where it will reduce just fine -- no need to slow down your searing process by reducing the accumulated juices right then. I tried this last night with a 4 lb eye of round roast, cut up into 1-1.5" cubes. I did it pretty much like Chris described. I added the mustard bread & near the end of cooking a tablespoon of dark chocolate chips. I used red wine vinegar as that was all I had around the house at the time. Wow! It was very tasty. I didn't get any pics this time, but I will next time I make it. Darko - that sounds great ~ those final touches that Chris introduced us to are really the jewels of the crown, in my opinion. This recipe can be as basic as one wants it to be - making it a true peasant food - and with a few simple additions it can really be thrown into overdrive. Glad you like it, and that your first preparation was a success - I am sure that it won't be your last! No worries there, this will definitely not be my last time. Soups & Stews are one of my favourite things to make, simply because minor changes in ingredients or techniques make totally different dishes. For me a soup or a stew is like playing with LEGO.... A few basic building blocks and a few minutes, and you can master the technique. After that, you can spend a lifetime playing with it, and make something different each time. I hope no one minds yet another carbonade post, but it all honesty, I never get tired of this wonderful stew. It has to be hands-down one of the best things in life, and has become a family favourite. Being simple and easy to prepare is only an added bonus to this humble, nutritious, delicious peasant meal. Unfortunately, I discovered that the kids had used all of it before I could even really give it a try - time to make some more, I guess! I had used the beef and chicken varieties before, with very good results, and was expecting wonderful things with the "new" vegetable flavour, which as far as I can tell is not yet available in my area. I was really looking forward to trying it, hoping that it would add something just a little special to the final product. Our Montana beef is always a treat to use, thanks to its very good flavour. And then watched as the batteries in my camera died - with no way to get more. d) Finally, I also added a bit of dark chocolate, just as the carbonade was finished. Results were amazing, everything came together very well. The star of the dish - my Montana beef - was fork-tender and mouth-watering, a perfect canvas for the rest of the flavours of the dark, rich, thick stew, which was served over home-made garlic mashed potatoes. I was especially pleased with the use of the vegetable base and the huckleberry beer; each contributed their unique characteristics to the final flavour of the dish without taking over. All-in-all, another carbonade success! My only question to those who haven't tried this easy, delicious stew is, "Why not?" 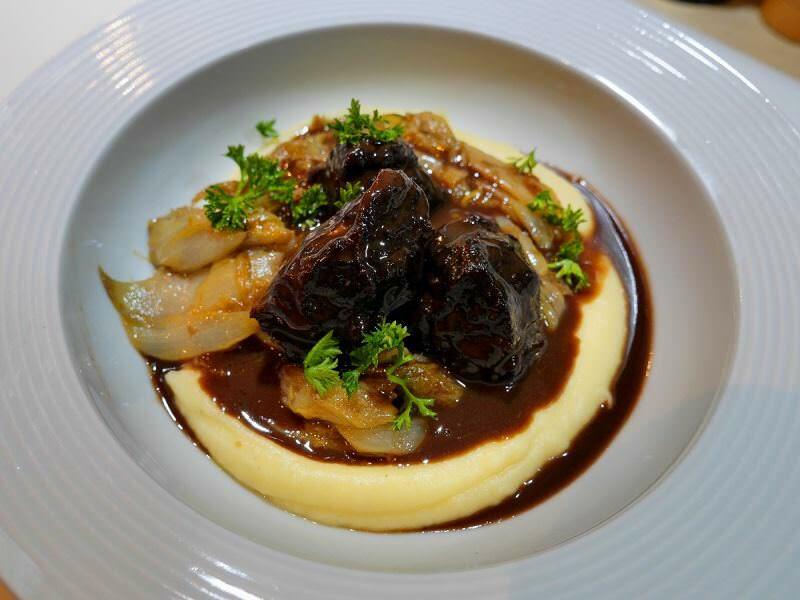 Carbonade Flamande is a lovely autumn and winter dish. Sorry about your camera´s batteries Tas; none the less, I am sure it was delicious with Montana Beef! To all Other Forum Members: all the dishes look absolutely sensational. Hi, Ian. Thanks for posting the link. And welcome to Foods of the World. We're a diverse bunch, here, with experience ranging from newbies to professionals, sharing a passion for global cuisines. Why not stop by the Members Lounge forum, and tell us a little about yourself, particularly your cooking interests. As always, very good results! Thanks to Saveur's online magazine and their "Recipe of the Day," - as well as recent correspondence from Chris - my interest in and love for this dish has been re-kindled. I have been doing some more reading up on this wonderful stew, and have a couple of "new" recipes to post; actually, they are not new at all, but they are new to the forum. I am not touting any of these as authoritative or even necessarily "authentic," but they do present the dish from a couple of different points of view and might offer some insight or ideas as to the ingredients or preparation. For myself, I intend to follow Chris's notes and advice, and look forward to the results. Note: Please take a moment to follow the link above and read about this book; doing so helps this forum pay for itself! Preheat oven to 325 degrees. Cut the beef into slices about 2 by 4 inches across and 1/2 inch thick. Dry on paper towel. Put a 1/16-inch layer of fat or oil in skillet and heat until almost smoking. Brown the beef slices quickly, a few at a time, and set them aside. Reduce heat to moderate. Stir the onions into the fat in the skillet, adding more fat if necessary, and brown the onions lightly for about 10 minutes, stirring frequently. Remove from heat, season with salt and pepper, and stir in the garlic. Arrange half the browned beef in a casserole and season lightly with salt and pepper. Spread half the onions over the beef. Repeat with the rest of the beef and onions. Heat the stock or bouillon in a browning skillet, scraping up coagulated cooking juices. Pour it over the meat. Add enough beer so the meat is barely covered. Stir in the brown sugar. Bury the herb bouquet among the meat slices. Bring casserole to a simmer on top of the stove, then cover the casserole and place in lower third of preheated oven. Regulate heat so that liquid remains at a very slow simmer for 2.5 hours, at the end of which time the meat should be fork-tender. Remove the herb bouquet. Drain the cooking liquid out of the casserole into a saucepan, and skim off the fat. Beat the starch and wine vinegar mixture back into the cooking liquid and simmer for 3 to 4 minutes. Carefully correct seasoning. You should have about 2 cups of sauce. Pour the sauce over the meat. When ready to serve, cover the casserole and simmer slowly for 4 to 5 minutes until the meat is thoroughly heated through. Either bring the casserole to the table or arrange the meat on a hot serving platter and spoon the sauce over it. Surround with potatoes or noodles and decorate with parsley. Preheat the oven to 350 degrees*. Pat the strips of beef completely dry with paper towels and drop them into a bowl. Sprinkle with the salt and a few grindings of pepper and toss the meat about with a wooden spoon until it is evenly seasoned. In a heavy 4- to 5-quart enameled or stainless-steel casserole, melt 4 tablespoons of the lard over high heat until it is very hot but not smoking. Brown the beef in the hot lard, a handful at a time, turning the strips frequently with a slotted spoon and regulating the heat so that they color richly and evenly without burning. As they brown, transfer the pieces of beef to a plate and brown the remaining meat similarly, adding more lard to the pan if necessary. Drop the bacon bits into the fat remaining in the casserole and, stirring frequently, cook over moderate heat until the bits are brown and crisp and have rendered all their fat. With a slotted spoon, transfer the bacon to paper towels to drain. Pour all but about 1/4 cup of fat from the casserole. Add the onions to the casserole. Stirring frequently, cook over moderate heat for about 15 minutes, or until the onions are soft and delicately browned. Add the garlic and stir in the flour with a wooden spoon. When the flour is completely absorbed, pour in the beer and 1/2 cup of the beef stock. Bring to a boil over high heat, stirring constantly with a whisk until the sauce thickens. Add the bouquet of parsley and bay leaf, the thyme and sugar, and return the beef and any liquid that has accumulated around it to the casserole. Stir in the bacon. The liquid should completely cover the meat; if necessary add up to 1/2 cup more of the stock. Cover tightly and place the casserole in the middle of the oven. Bake for 1.5 hours*, or until the beef is tender. Just before serving, stir in the vinegar and taste for seasoning. Serve at once, directly from the casserole or from a large heated bowl. NOTE: Carbonnades a la Flamande is traditionally accompanied by hot boiled potatoes. *This seems too high (temperature) and too short (cooking time) to me; if you try this, I would suggest using the lower temperatures and longer cooking times discussed in previous posts. As we all know, Photobucket has recently delivered many forums (including ours) a severe blow. Because of this, Chris's beautiful photos of his preparations and methods for Carbonnade were lost. However, with the recent re-kindling of my interest in this wonderful dish, I wrote to Chris and asked if he would be so kind as to re-send them. I am happy and grateful to say that Chris was very willing to share them again, so I have returned those photos to his post. If I am able to get any other photos of this most special of meals, I will be sure to post them. If anyone else makes this, please share your experience with us! I've turned out many plates in my career, but only certain dishes have become meals I feed my own family, like boeuf carbonnade a la flamande. 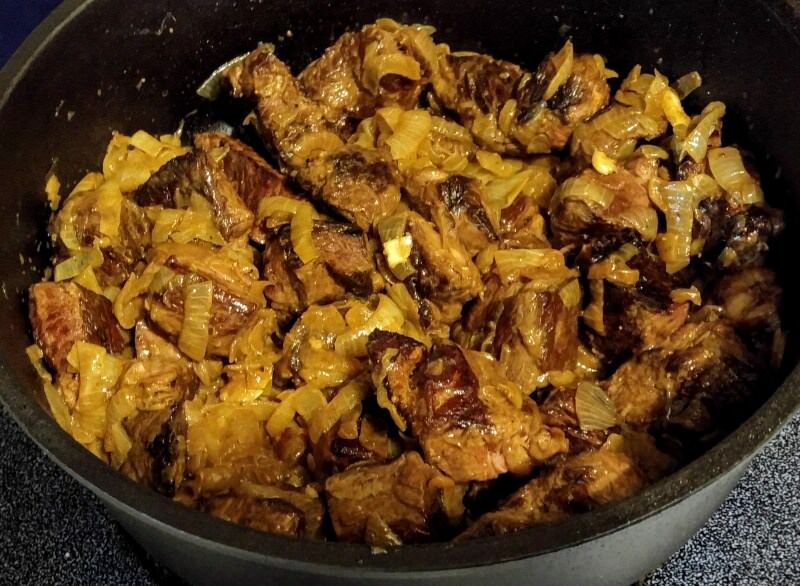 I was taught to make this Flemish beef and onion stew by my mentor, Belgian chef Leon Dhaenens, when I was a young cook. 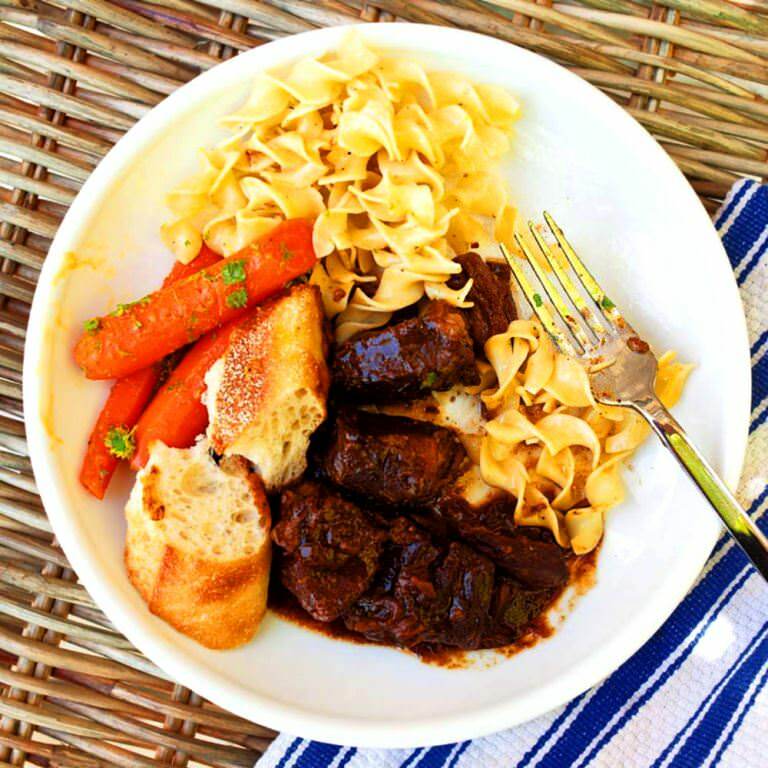 Unlike French beef stews made with wine, carbonnade relies on the deep, dark flavor of Belgian abbey-style beer. 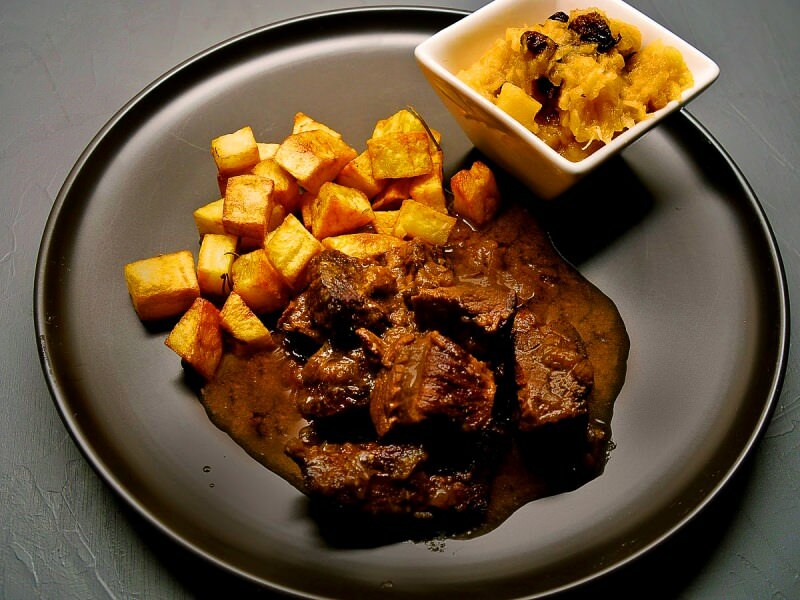 But what really gives carbonnade its distinctive character is the addition of brown sugar and a fillip of cider vinegar, a sweet-sour combination that plays beautifully against the caramelized onions and rich beer. Season beef with salt and pepper in a bowl; add flour and toss to coat. Heat 2 tbsp. butter in a 6-qt. Dutch oven over medium-high heat. Working in batches, add beef; cook, turning, until browned, about 8 minutes. Transfer to a plate; set aside. Add bacon; cook until its fat renders, about 8 minutes. Add remaining butter, garlic, and onions; cook until caramelized, about 30 minutes. Add half the beer; cook, scraping bottom of pot, until slightly reduced, about 4 minutes. Return beef to pot with remaining beer, stock, sugar, vinegar, thyme, parsley, tarragon, bay leaf, and salt and pepper; boil. Reduce heat to medium-low; cook, covered, until beef is tender, about 1 ½ hours. Serve with bread. When making carbonnades, you don’t use pale colored beer like tripel or any pils, wit (white) or whatever. The best choice to use would be a dark abbey beer or a dubbel, which is a very good option since it has less alcohol. These beers are mostly quite sweet and bitter, which is why you never use only beer as the stew liquid in a carbonnade; you will end up with a bitter preparation if there’s no water or beef stock added! More on this below. Many swear by using a red beer, such as Rodenbach. When I was younger, red beer was very acidic and more a high summer drink, preferably drunk with a few fresh shrimp on the side that you peeled on the fly. Since many years now they took out the biggest part of the acidity. Still, it’s one of Belgian favorites for making carbonnades, together with Oud Bruin (Old Brown). Per kilo of meat, you should 1 bottle of 33cl beer, plus the same amount of water or stock. You want to just barely cover the meat. In the older days, people added their beer, filled the beer bottle with water and added it to the stew; simple and easy, so I do that as well. I use water and I add a talebspoon of concentrated beef bouillon, like your “Better than Bouillon” - it works perfectly. Of particular importance is the acidity balance of carbonnade. When using abbey beer, you need to add some vinegar to your preparation to cut the sweetness of the beer. Start by adding a good tablespoon of red or white wine vinegar (whichever you prefer) per kilo of meat. 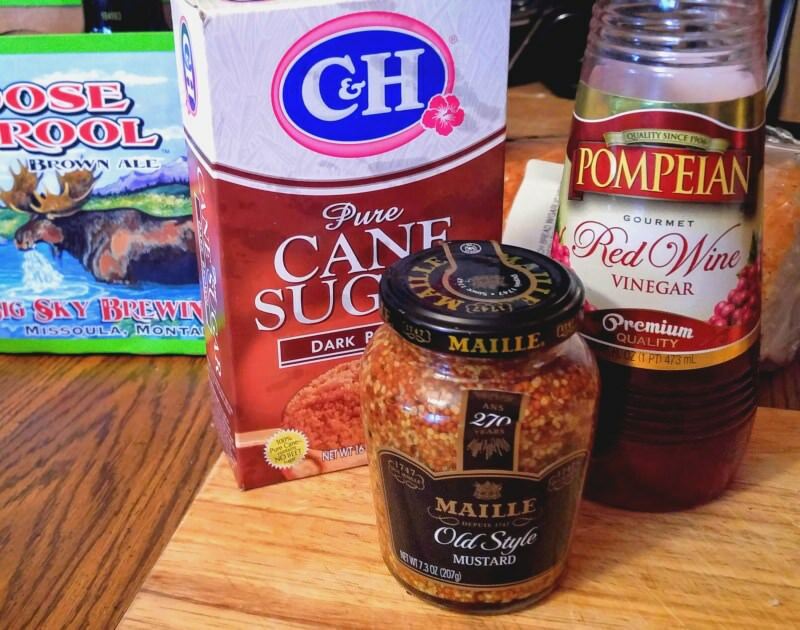 Add it when you put the beer and water in, together with a generous spoon of dark brown soft sugar. At the end of the preparation, check the balance again and add a little more vinegar, if needed. When using a more acidic beer, taste first; you might not need to add so much but a little vinegar will bring your preparation to another level! Carbonnades are all about concentrated flavors and balance; that’s why you play with the lid of the pot. Towards the end, put the lid askew to let liquid evaporate. The meat has to be completely soft and the sauce thick and dark. Regarding Sint-Bernardus Abt (with the blue label) from the Trappist brewery in Watou: There is a public secret over here about that beer. Another Trappist brewery in Westvleteren brews what has been nominated many times the best beer in the world. In fact, in much earlier days, this beer was brewed on demand by the Trappist monks in Watou. So, in Watou they know the Westvleteren recipe! So, the secret is that Sint-Bernardus Abt is a copy of the Westvleteren Trappist. Many people will nominate Sint-Bernardus Abt as a better beer than the Westvleteren beer!!! It’s one of my absolute favorites. There's also Kasteelbier donker (donker means dark), which is very fit for use in carbonnade, but probably a bit too sweet for some to drink. Kasteelbier donker is very similar to all dark abbey beers. They called it Kasteelbier instead of abbey beer, because they own a castle (kasteel) in Ingelmunster. The family has done quite well by working hard and driving very hard deals and keeping their money in their own pockets. Frugal is the word, next to earning a lot of money; the second criteria to get rich and to stay rich! They are also well known for their Gueuze and kriek beer. While doing research for another project, I came across a slightly-different version of this dish in the spiral-bound supplemental recipe book for Time/Life’s Foods of the World - The Cooking of Provincial France (1968). Unfortunately, there were no notes or photos to go with it, but I will add it here to the collective knowledge on the subject. I will also post it in the "France" forum, since that is where I found this this particular recipe, and because the dish is made there, as well. To remove excess saltiness, blanch the pork dice by simmering them in 2 cups of water for 5 minutes, drain on paper towels and pat dry. In a heavy 10- to 12-inch skillet, melt 1 tablespoon of the butter over moderate heat, and in it brown the pork dice, stirring them or shaking the pan frequently, until they are crisp and golden. Remove them with a slotted spoon and set them aside to drain on paper towels. Pour off almost all the rendered fat from the skillet into a small bowl, leaving just enough in the skillet to make a thin film about 1/16-inch deep on the bottom. Set the bowl of fat and the skillet aside. In another heavy 10- to 12-inch skillet, melt 4 tablespoons of butter over moderate heat. When the foam subsides, add the sliced onions and cook them over low heat, turning them frequently with a wide metal spatula, for 20 to 30 minutes, or until they become limp and lightly colored. While the onions are cooking, heat the fat in the first skillet over moderate heat until it almost smokes. Dry the beef with paper towels, then brown it in the hot oil 4 or 5 chunks at a time to avoid crowding the skillet, adding more pork fat as needed. When the chunks are a rich brown on all sides, remove them with kitchen tongs to a Dutch oven or a heavy, flameproof casserole about 9 to 10 inches in diameter and at least 3 inches deep. Bury the bouquet garni in the meat. Preheat the oven to 350°F. After all the meat is browned, remove the skillet from the heat and stir the flour into the fat remaining in it. If the mixture seems dry, add a little more pork fat (or vegetable oil). Return to very low heat and cook, stirring constantly, until the roux is amber color: be careful it doesn't burn. Remove from heat, pour in the beer and beef stock, and beat vigorously with a wire whisk until the roux and liquid are blended. Bring to a boil over moderate heat, whisking constantly as the sauce thickens. Boil for 1 minute, then mix in the sugar, vinegar, garlic and thyme, and simmer over low heat for 2 or 3 minutes. Taste the sauce and season it with salt and pepper if needed. When the onions are done, add them to the casserole, and pour the sauce over the onions and meat, stirring the mixture gently. The sauce should nearly coverthe meat; add more beer if needed. Bring the casserole to a boil on top of the stove, cover it tightly and place it in the lower third of the oven. Cook, regulating the oven heat so that the meat simmers slowly for 1.5 to 2 hours, or until the meat is tender when pierced with the tip of a sharp knife. Before serving, let the carbonades cool for a few minutes. Then skim off the surface fat, discard the bouquet garni and taste the sauce for seasoning. Sprinkle the carbonades with the crisp pork bits and garnish with chopped parsley. This past weekend, I prepared another Carbonnade à la Flamande. This one was easily the best I've yet made, so I will share the story with you. This is most likely the "final" recipe that I will post on the matter; from this point on, I would say that it is all about perfecting the method and technique. It is the result of much research; carefully poring over many posts, websites, email exchanges and social media messages. Most of all, it is thanks to the patient assistance of a good friend in Flanders, and I owe him a debt of gratitude that I cannot repay. This recipe will easily feed 6 to 8 people; cut it in half for smaller households. 1. Trim fat to 1/4 inch and cut roast into chunks, approximately 2 inches x 3 inches. 2. Peel onions and cut in half lengthwise; bisect the halves and slice “across the grain,” approximately 3/8-inch thick. 3. Peel and crush the garlic; mince it, if you wish. 4. Prepare beef stock, if necessary. 5. Remove the crusts from the slices of bread and allow them to go a bit stale. 6. Assemble the remaining ingredients, measuring them out as necessary. Use a frying pan and a large cooking or stew pot; cast iron is recommended, but not absolutely necessary. Put the cooking pot over low to medium-low heat, melt 2 or 3 tablespoons of butter and sweat the onions as long as you can, allowing them to cook their moisture out and get a little bit of colour. Do not let them scorch, or your Carbonnade will be bitter. When the onions cooked down almost as much as they can be, reduce the heat a little and continue to stir them now and then as you progress with the preparation. Heat a thin layer of oil as hot as you dare, depending on your frying pan. Sear the chunks of meat in batches, taking care not to cover-crowd the pan; half-full is much better, otherwise, you will be boiling the meat in their own juices instead of searing it. You need to take your time for this; put the chunks in one by one and don't move them around all the time...don't shake the pan either, just leave them alone for a few minutes and then turn them. Sear all sides nicely. 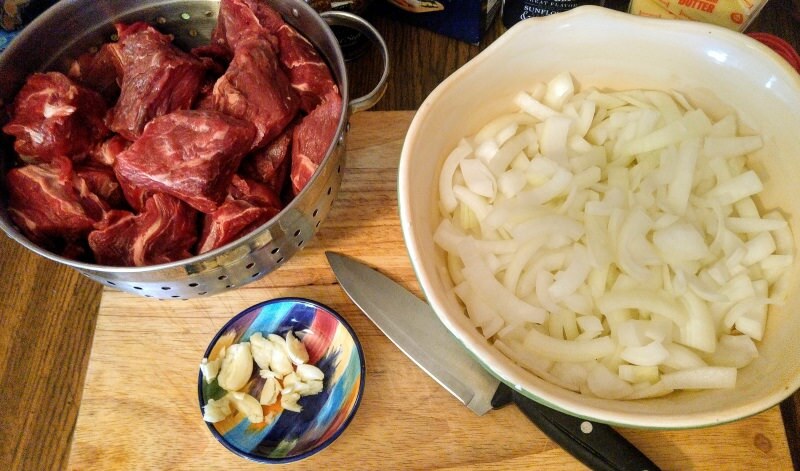 Transfer the beef to the cooking pot on top of the onions; add some salt and pepper and the garlic. Sear the next batch of beef chunks until the all meat is done. You may have to add some oil to the frying pan as you progress, but do not remove the fond that is building up in the pan. Be careful with the amount of salt you add, as the Carbonnade will reduce during cooking. Once all of the beef has been seared, sprinkle the flour over the meat that is now on top of the onions in the cooking pot. Put the fire a little higher, stir and let the flour cook just a little. Put the frying pan back over the heat and pour a bottle of dark brown beer in it. Scrape the suc or fond from the bottom using a wooden spatula. Pour this mixture over the meat in the cooking pot. Add the second bottle of beer, then fill the bottle with water or stock and add to the pot; be sure to use the same amount of water or stock as you did beer. The meat should be only just covered with liquid. Add one coarsely-cut carrot and concentrated beef base (if desired), your thyme, 3 or 4 bay leaves, 2 tablespoons of dark brown sugar and the same amount of red or white wine vinegar. Spread a generous layer of Dijon-style mustard on the crustless slices of bread and place them in the cooking pot, mustard-side-down. The mustard gives the sour component, providing balance; you can add a few drops of vinegar at the end of the cooking time to correct the acidity, if necessary. Place the cooking pot in the oven at 325 degrees for 90 minutes; alternately, you can continue to simmer the Carbonande on the stove top, stirring as necessary and taking care that nothing sticks to or scorches on the bottom of the pot. Toward the end of the cooking time, put the lid of the pot askew to let liquid evaporate. At the end of the 90 minutes, check the beef; if the meat isn't not tender enough or the sauce not thick enough, give it another 30 minutes. When the beef has become completely tender and the sauce thick and dark, remove the pot from the oven. Correct the seasoning and acidity, if necessary, then serve with boiled or fried potatoes and the beer you used to make the stew. I made the Carbonnade exactly as described above, except for the time and temperature in the oven, which I will explain below. Where a range of the amount of ingredients is listed (such as the beef, onions, flour etc. ), I went with the higher amount. The resulting Carbonnade was very good, and seemed to be almost perfect; in fact, and was certainly my best preparation so far, but there was still a little room for improvement. Here are some notes based on the day. The lighting in my house seems to be a bit off; the fat of the beef and the onions should be white, rather than yellowish. For the beef, I used a very good chuck roast from the very small herd of Angus/Hereford cross cattle that my parents own, cutting it into largish chunks. Chuck roast, as well as other "tough" (and once-upon-a-time cheap) cuts of beef are perfect for this meal, due to the tenderness and flavour achieved through the long, slow cooking process. 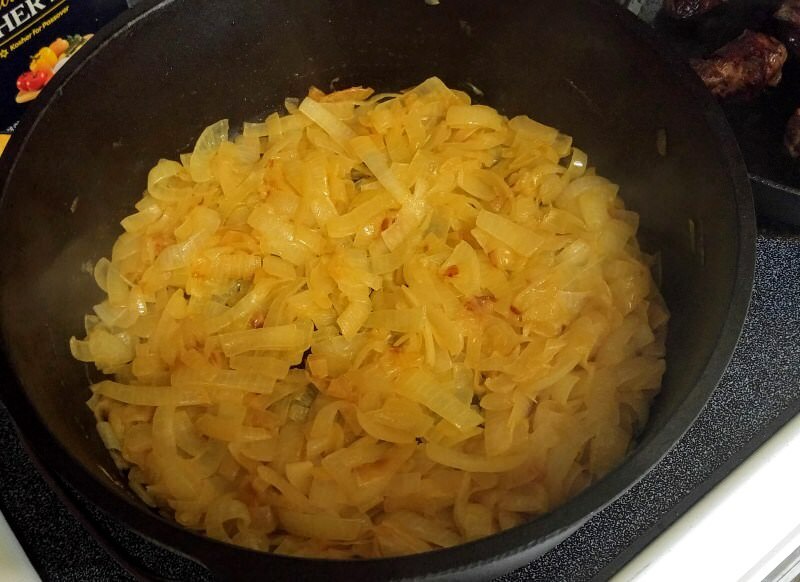 To begin, I melted 3 tablespoons of butter in my cast iron Dutch oven, then tossed the onions in to begin their long, slow cook. Throughout the process, I stirred them often as they released their liquid and cooked down, taking care not to let them scorch or burn. It wasn't long before the onions were really smelling good, filling the house with an incredible aroma that promised many good things. Once the onions had cooked down and were starting to get some colour, I added my crushed garlic. I used three good-sized cloves, which turned out to be just right; any more would simply have been too much. Before long, the mild heat from the pot opened up the aroma of the garlic, which blended nicely with the onions; things were starting to get really good, here! It seemed to me that searing for 5 minutes on the first side, then about 4 minutes on the remaining sides, produced good results. Once again: weird lighting! The onions weren't quite this "yellow," but they did have some very good colour on them. I added the beef to them, along with a little salt and freshly-ground black pepper, then continued with the next batch of beef chunks. As you continue to sear the batches of beef, you may need to reduce the heat and adjust the times a little bit, in order to prevent scorching as your pan finds its groove. As I seared the beef and added it to the Dutch oven, I continued to grind some pepper over each batch, but only added a little salt every other batch, as the stew will reduce and become concentrated wile it cooks. Next, I added the flour to the beef and onions, then brought the heat up just a little as I stirred the flour into the mix. the object here is to let the flour cook just a bit, in order to lose its "raw" taste. It is similar to the idea of creating a roux, but you do not take it anywhere near as far as that. When making carbonnades, you don’t use pale colored beer like tripel or any pilsner, wit (white) or whatever. The best choice to use would be a dark abbey beer or a dubbel, which is a very good option since it has less alcohol. These beers are have a distinct amount of sweet and bitter, which is why you never use only beer as the stew liquid in a carbonnade; you will end up with a bitter preparation if there’s no water or beef stock added! Many swear by using a red beer, such as Rodenbach. When I was younger, red beer was very acidic and more a high summer drink, preferably drunk with a few fresh shrimp on the side that you peeled on the fly. Since many years now they took out the biggest part of the acidity. 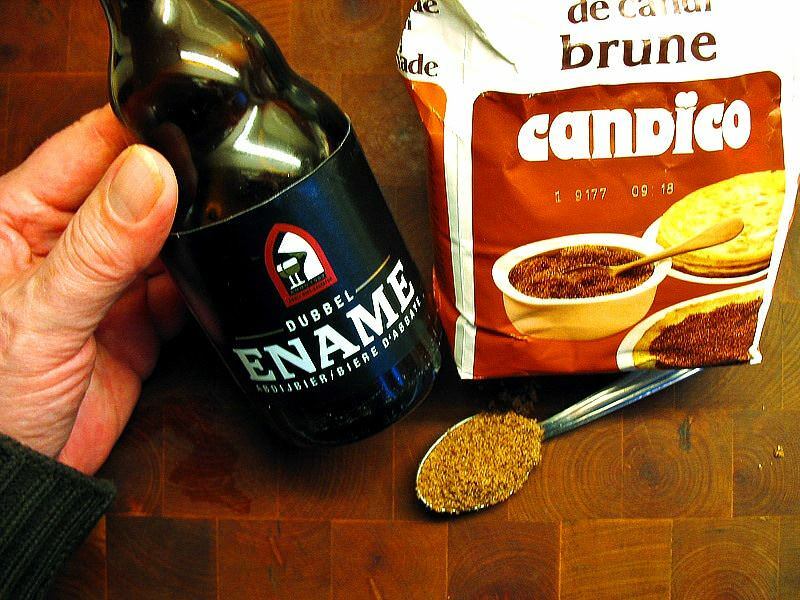 Still, it’s one of Belgian favorites for making carbonnades, together with Oud Bruin (Old Brown). Unfortunately, I had only one bottle of trappist dubbel in the house (Westmalle), and needed two; so earlier that day I had set my mind to finding a substitute. Given the parameters, the "next best thing" would probably be an English porter, but a search throughout my small, one-horse town didn't turn up any of that either. I did, however, find one beer that I figured would be perfect for this; even better, it is brewed in Montana! 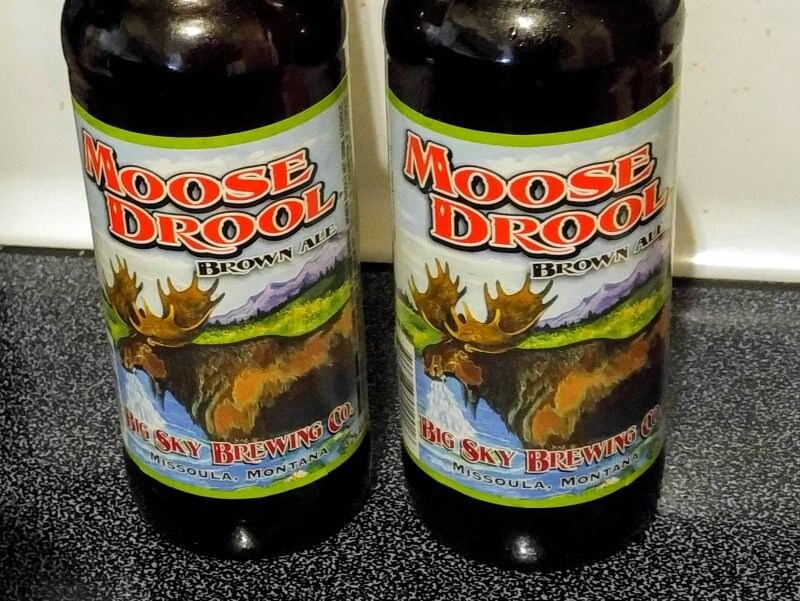 Moose Drool is an American take on an English brown ale that is brewed at Big Sky Brewing Company in Missoula. In spite of its dubious name, it is a very good beer that meets all of the criteria that I was looking for, with a very good colour, a touch of sweetness and with just enough hop bitterness to balance and compliment the other ingredients. The way things turned out, I couldn't have asked for a better substitute. When the beer hit the hot frying pan, it released the brown bits from the bottom, known as the suc or fond. Using a wooden spatula, I scrapped all of this up and mixed it in with the beer, then poured everything from the frying pan into the Dutch oven. I added the second beer to the pot, then two bottles' worth of beef stock; as a rule of thumb, you want one bottle of beer and one bottle of stock (or water) per kilogram (2.2 pounds) of beef, which will give you just the right amount of braising liquid. As my friend in Belgium told me, "In the older days, people added their beer, filled the beer bottle with water and added it to the stew; simple and easy, so I do that as well." In Belgium, the bottles are 33cl, which is a little less than the standard 12-ounce bottle of beer; however, since I had a little extra beef to braise, I figured that it would all even out. I decided to forego the optional, coarsely-chopped carrot; however, I did add about 1.5 tablespoons of roasted beef base, from Better Than Bouillon. This step is not necessary, when using stock, but it can provide a little boost to the stock, if you desire. The concentrate is a bit more salty than I prefer; however, I like the deep, beefy foundation that it provides, so I took care to be very conservative with my added salt early on. As it turned out, I seem to have achieved a good balance, and was happy with the results. Of particular importance is the acidity balance of carbonnade. When using abbey beer, you need to add some vinegar to your preparation to cut the sweetness of the beer. Start by adding a good tablespoon of red or white wine vinegar (whichever you prefer) per kilo of meat. Add it when you put the beer and water in, together with a generous spoon of dark brown soft sugar per kilo. At the end of the preparation, check the balance again and add a little more vinegar, if needed. 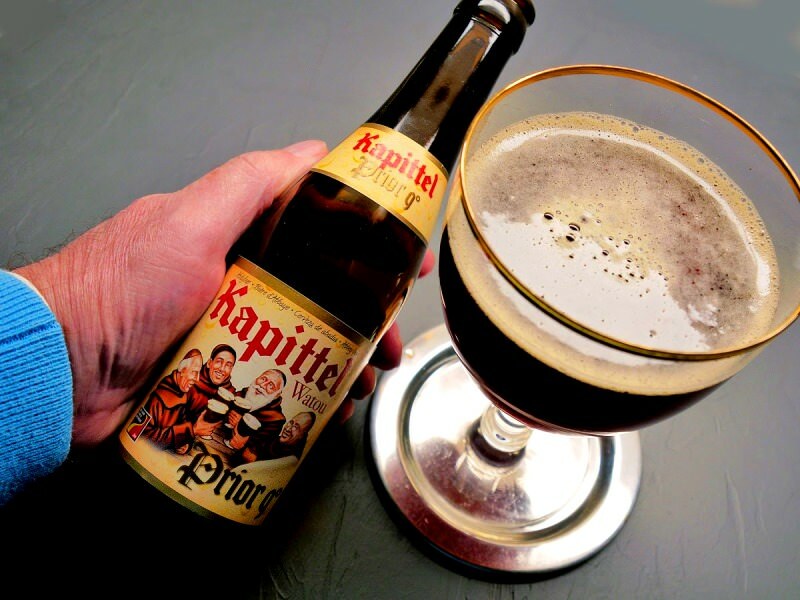 When using a more acidic beer, taste first; you might not need to add so much but a little vinegar will bring your preparation to another level! My loaf of "French" bread was on the smallish side, so I used a total of 5 slices of bread; If you use slices from a regular-sized loaf, 2 or 3 slices will most likely be enough. Where the mustard is concerned, I went with a whole-grain "old style" variety from Maille that I really like; this mustard worked very well, but in the future I will probably use something that is more finely ground, as I personally found the seeds in the finished stew to be a distraction. I should stress, however, that this really was a good mustard to use, full of rich, rustic flavour, and it boils down to personal preference. I then covered the Dutch oven and placed it into a preheated oven in order to begin its long, slow cook. Regarding time and temperature, I set the oven at 300 degrees for 90 minutes, removing the lid after about 60 minutes; in retrospect, this was a little conservative on my part, as the stew was pretty thin at the end of the allotted time, and the beef wasn't quite fully tender. I brought the Dutch oven to the stove top and continued to simmer off some of the liquid; after half an hour of this, it had started to thicken up pretty well, but was still just a bit thin to my liking. It seemed to me that another half-hour of this would have been perfect, but by this time everyone was pretty impatient to eat, so I went with it. It tasted good; in fact, it tasted absolutely wonderful, but I personally would have preferred it just a bit thicker. With that in mind, I have set the time and temperature of the recipe to that shown above, and will continue to refine this as necessary until it is "dialed in" to perfection. 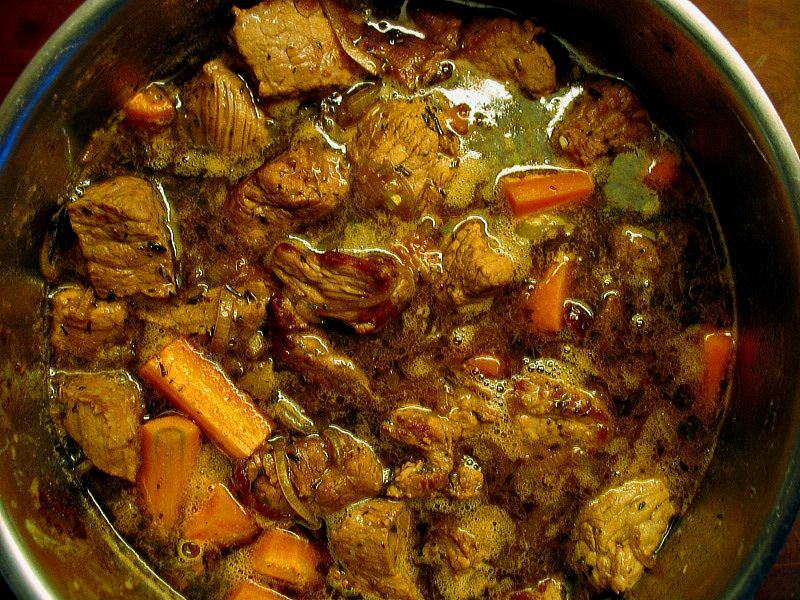 Another option is to simmer the Carbonnade on the stovetop, rather than in the oven; this could allow you to have better control, adjusting the lid to reduce the sauce, as necessary. Unfortunately, most times I try to cook stews and other similar dishes this way, I end up running the risk of scorching the bottom of the pan (and the meal), even on the lowest temperature. Having said that, I will try it in the future, and be sure to monitor the progress of the cooking carefully, in order to hopefully prevent that from happening. If, in spite of all efforts, your sauce comes out really thin, you can scoop all of the meat out of the pot and reduce the sauce over high heat to your desired thickness, taking care to stir often and not allow it to scorch. The notes above underscore an axiom where Carbonnade is concerned: having a well-reduced sauce makes a big difference in the taste. Carbonnade à la Flamande is all about concentrated flavors and balance; nearly every step of the preparation of this dish is focused on that end. In any case, the Carbonnade was very close to ideal, but could have been a bit better where the thickness and consistency were concerned; something to remember for next time. The funny thing is that, when I served the meal to my famished family alongside simple boiled potatoes, there was not a single complaint about the thickness. Even with this small flaw, the flavours of the Carbonnade were exemplary, and everyone - including a couple of finicky souls - enjoyed it very much. In my own judgment, as mentioned above, this was easily the best Carbonnade that I have made to date, with better flavour, better balance and better highlighting of "the star of the dish" than I have ever achieved. I am, of course, referring to the beef, and one simple alteration made a lot of difference. When I was reading through the advice from my friend in Flanders, I noticed that he added a little salt and pepper after the meat was seared, rather than before this step. In the past, I had always added the salt and pepper before, but this time I waited until removing it from the frying pan. The results were unique and delightful, in that the beef seemed to me much more highlighted and on its own, while the salt and pepper seasoned the sauce itself. This of course was helped along by the fact that I was using very nice beef, which the seasoning technique allowed to shine. The Moose Drool worked out much better than I imagined it would, but next time I will use a proper abbey ale. I will employ ground Dijon mustard, rather than whole-seed. I will use white wine vinegar, in order to compare it to using red wine vinegar. I will manage the cooking time and temperature better, with an eye toward a thicker, more concentrated sauce. That's all I have for now, everyone. If you have prepared this before, using the recipes listed above, I'd suggest that you try it as written here, in order to get a good sense of the difference; I truly believe that this preparation was as close as one can get without actually being in a Flemish kitchen. If you've never tried Carbonnade before, then this is a great place to start! As always, questions, comments, thoughts and feedback are most welcome - if anyone else tries this, I'd really like to know how you like it! 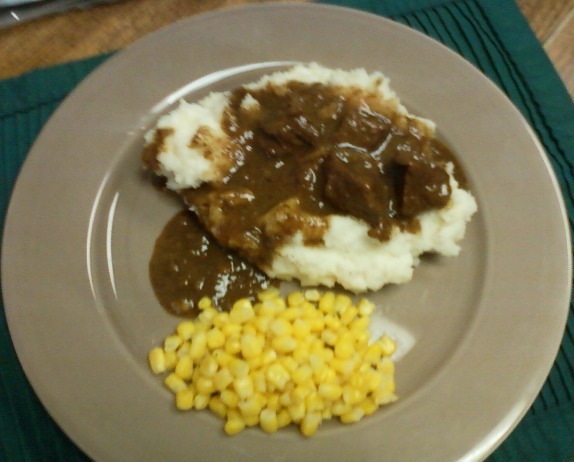 In it, he mentions that he tried his recipe for Carbonnade Flamande with his pressure cooker, and the results were better than ever; well, now I am going to have to see if I can cook Carbonnade in mine, in order to see how it goes. My challenge will be to adapt my recipe and method in the preceding post to my Instant Pot. We have a roast beef on deck for this coming weekend, and I was wondering what to do with it. I might see if I can give this a go, at that time. Wow .. Cool machine ..
Looks like a Dutch Kenwood ..